confirming their 2012 membership (the simplest way is to use the 'reply' button on our December e-mail). I apologize for this little effort asked to whomever appreciates and supports ASCAS activity. No action is required to unsubscribe. Members not confirming their membership will be automatically deleted from the sending of our monthly Newsletter and will be suspended on February 2012. Please accept my best wishes for a happy Christmas and a prosperous New Year and my thanks for your present or past appreciation of my work. With the advent of the Industrial Revolution, developments in metals production and the concept of mass production were adopted in America and Europe by the late 19th century. In the early 1900's, metal objects like jewelry boxes and other novelties, could be manufactured in quantity-far less costly to produce than the one-on items created by craftsmen previously available only to the wealthy. I married at the age of 50 and my son Marcus was born shortly thereafter. 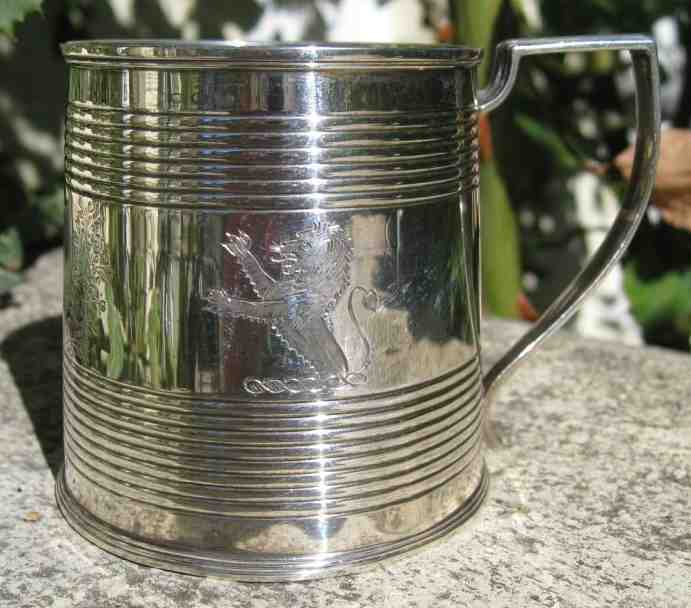 To commemorate his birth I bought him a typical silver Georgian mug. 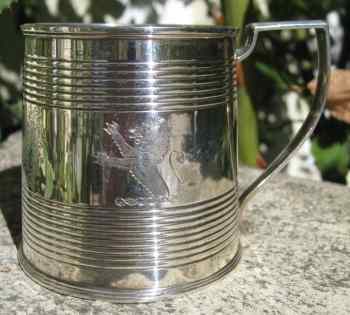 The mug bears London 1807 hallmark, maker S. Godbehere & Co. 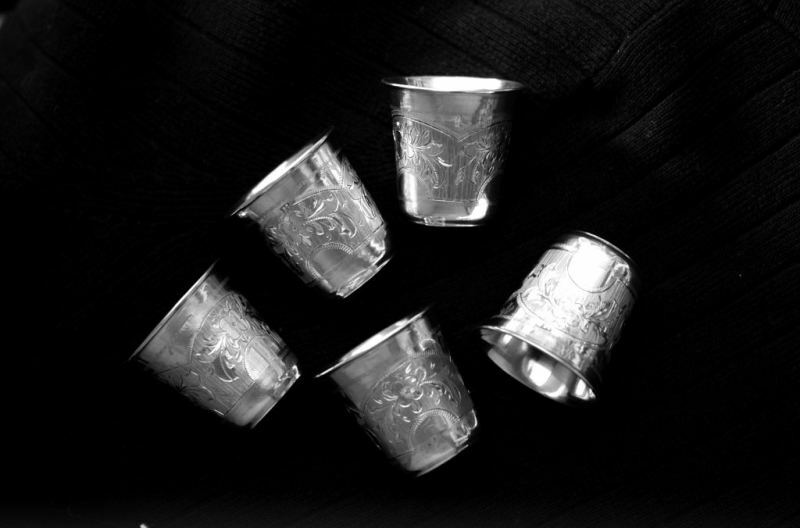 ...I have a set of Russian Silver, five vodka beakers and tray. 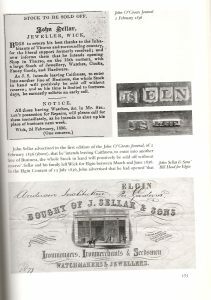 They are dated 1874 and 1875. This set belonged to my great great grandfather. 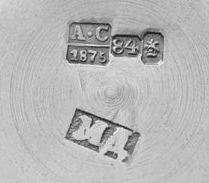 I would like to identify the maker's mark. I did some research on sites of antiquity, but in vain. ... 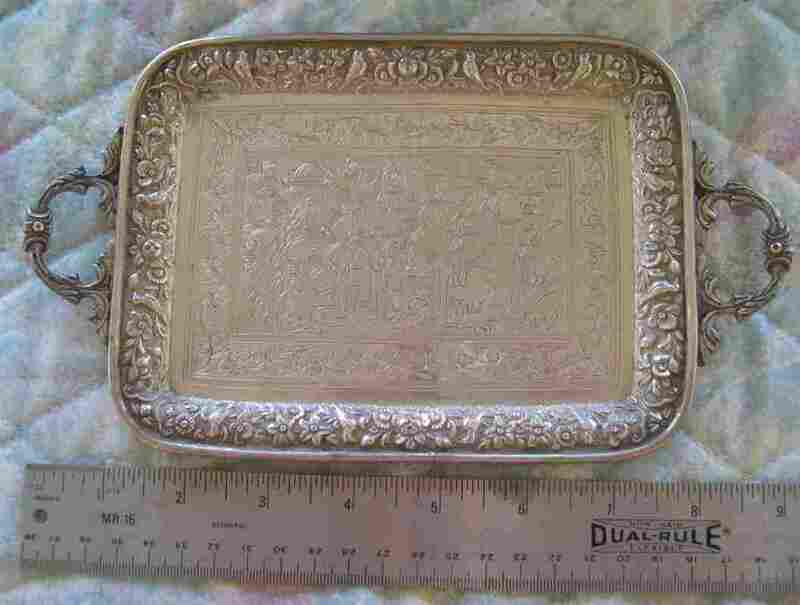 I have these two silver trays that I have been unable to identify or even understand. I was hoping that you could ask your readers to help me figure out what I have. 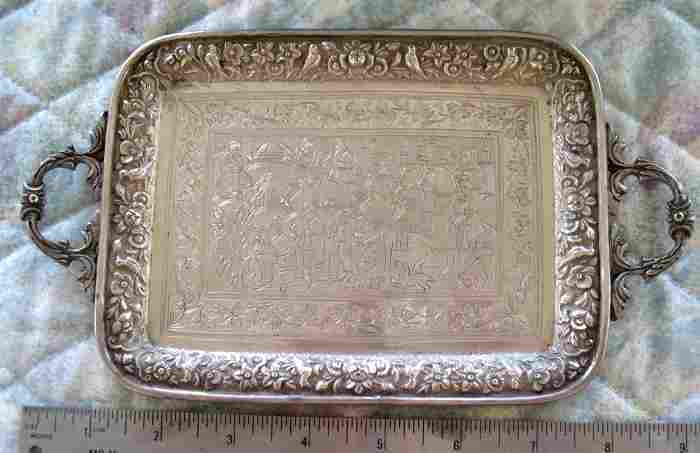 The tray measures about 9" wide. 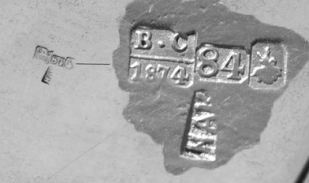 There are no marks of any kind to indicate either location or metal content. 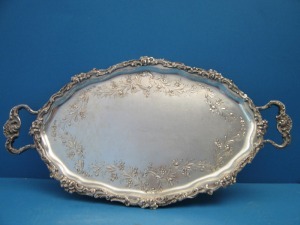 The trays have been tested and are of high quality silver. 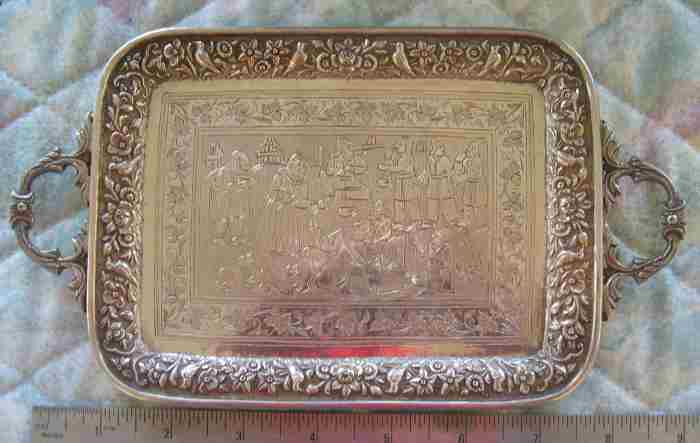 I suspect that these are Victorian era 'calling card' trays, but am open to other suggestions. 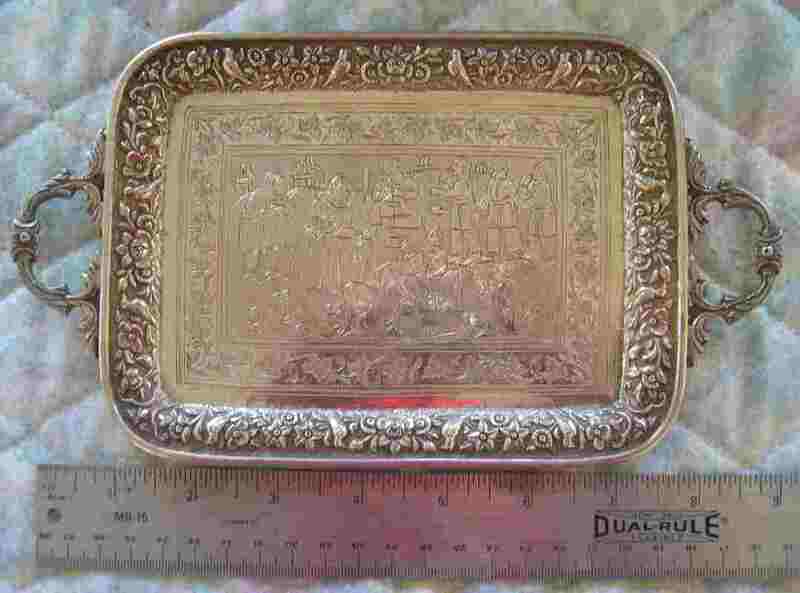 The trays have been hand hammered. 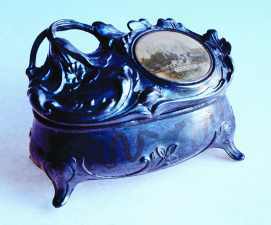 The outer rim is fine quality repousse work and depicts birds and flowers. The handles appear to be cast and soldered to the tray. 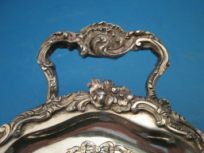 The inside border is engraved but there is no bright cut engraving. 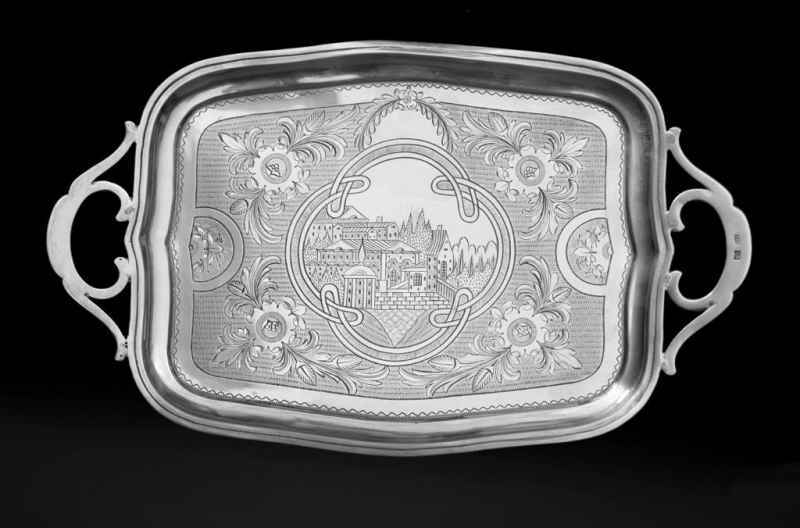 All of the interior workmanship which depicts everyday workers, dogs and background buildings are engraved. In the lower center is a reclining man who is being propped up by another man. An axe has dropped from his hand. A woman is standing over the man in period dress. Five other men appear to be standing around or talking. Some of the men are bearded and some are clean shaven. The three dogs are just sniffing around. There are four small buildings in the background. I suspect that the style of dress is the only clue as to origination. The second tray is almost the same measurements as the other tray and the handles and outer rim are basically the same (except for minor hand differences). The central figure is a horse and rider. There is also a second horse and rider. There are six other male figures talking or working. One is working on a sheaf of wheat. There are three dogs, one goat and one rabbit (hare?) and four small buildings in the background. Again there are no marks. I would appreciate any information or guesses you might have as to the purpose and where these pieces might have originated. .... 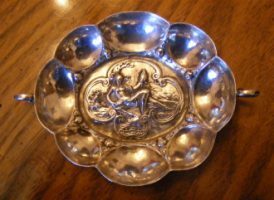 I have a tray I bought some years ago. 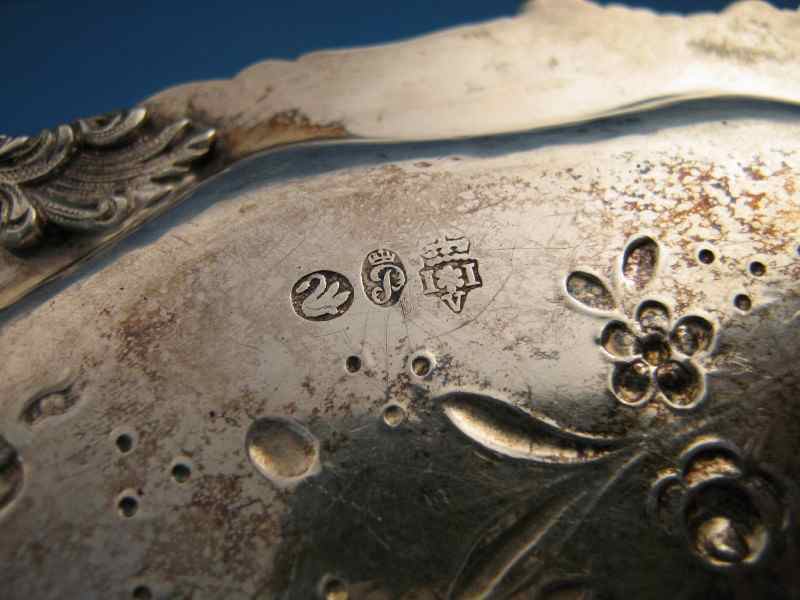 It was presented me by a German eBayer with the doubtful clue "maybe marks of French silver of the end of XVIII Century", it looks me actually a nice piece, but I don't think it's a French silver of that age. 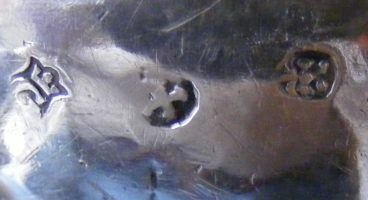 I was not able to identify the marks on any book I have on French silver. The shape unusually stretched out, the workmanship and the heaviness, maybe the alloy too (800/1000 or 13 lot) speaks me rather a German language. At last I resolved to buy it on the opinion it should be a German piece of the end of the 19th century (1890/ 1895), crafted in Hanau not much time after the "half-moon & crown" introduced, presumably by Georg Roth , bearing some of his "French fantasy marks". The tray measures cm 43 in length x cm 24 in width, and weighs 808 gr. I believe you are right. I presume that the tray is German and not French. 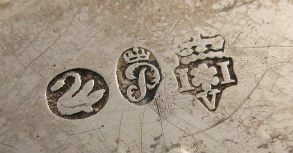 The mark with the "swan" look like the French import mark in use at the end of the 19th century. .... 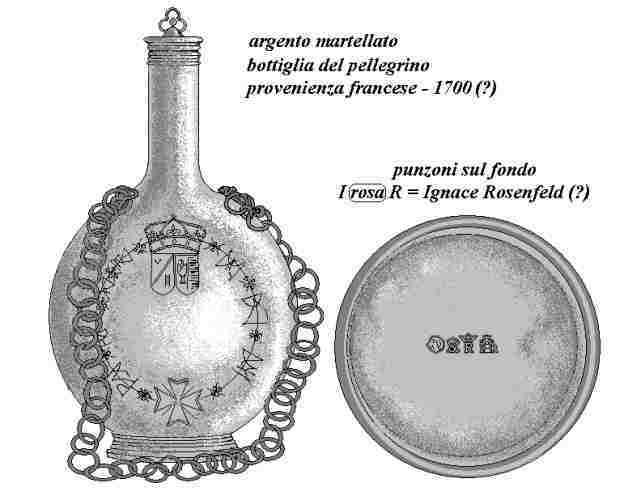 I send a drawing I did of a silver bottle inherited from my father. 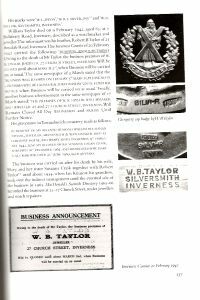 It has a cylindrical neck, an incision with a cross of Malta and a series of symbols that seems to recall a set of initials. There are two coats of arms, with scale and eagle, surmounted by a crown. 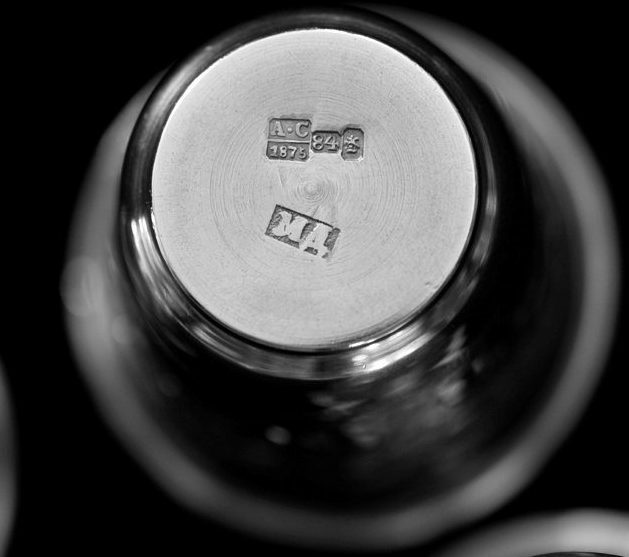 Under the bottle there are four marks: a head, crowned "a", crowned "R", "I an R" at the sides of the cup with a crown. .... 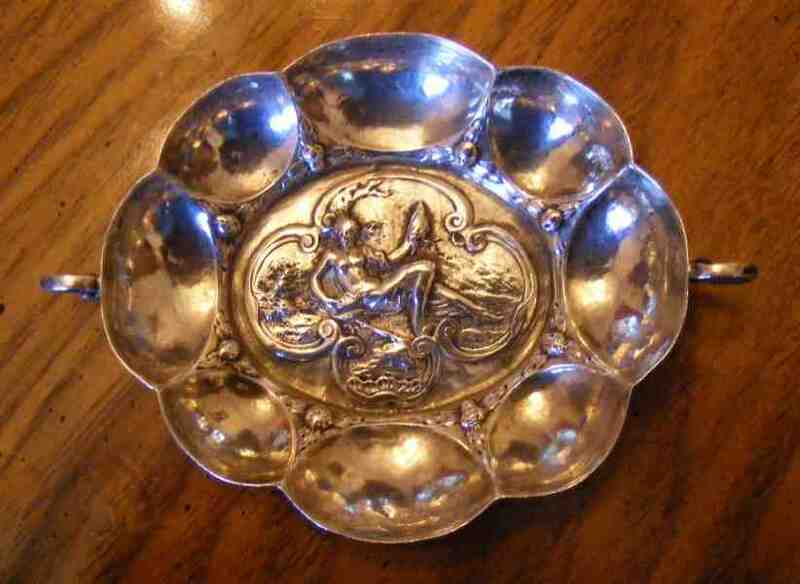 I rescued this beautiful nut dish from the "scrap" pile of a local jeweller and would appreciate any help possible in determining its origin and the meaning of the hallmarks. 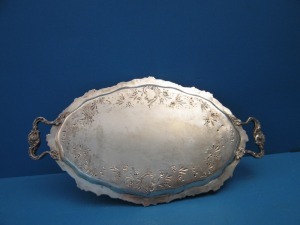 Your dish is typical example of Hanau silver (see more at http://www.ascasonline.org/articolo13.html ). The maker is (possibly) George Roth, Hanau, but another source attributes the mark to Wolf & Knell, founded in 1887. 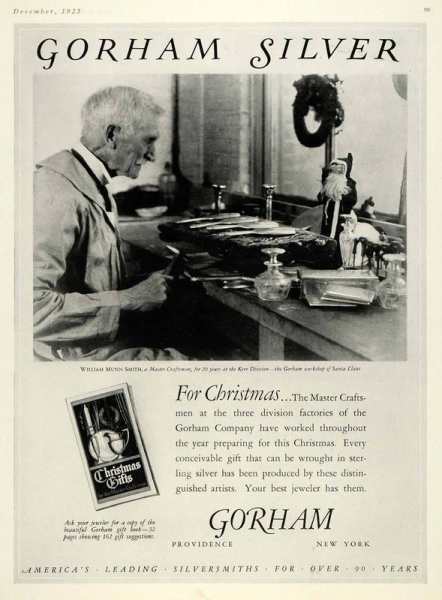 The Masters Craftsmen at the three division factories of the Gorham Company have worked throughout the year preparing for this Christmas. 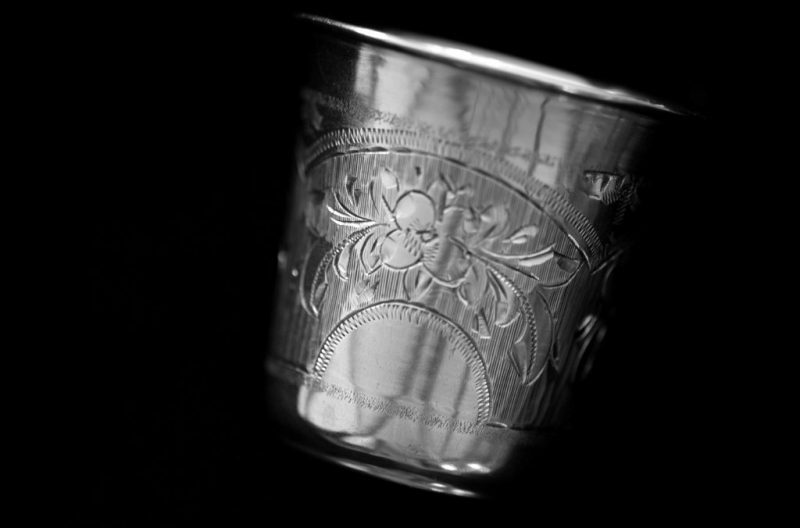 Every conceivable gift that can be wrought in sterling silver has been produced by these distinguished artists. Your best jeweler has them. 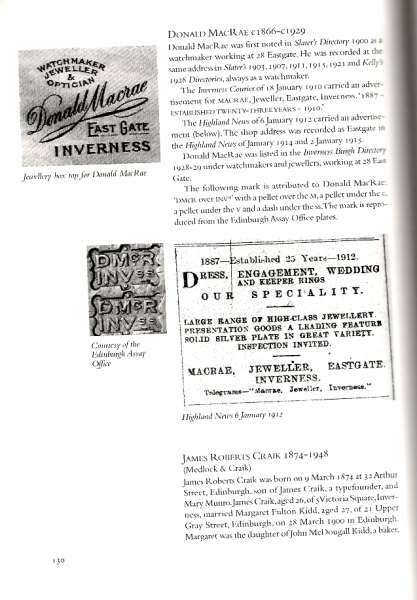 A Luckenbooth brooch is a Scottish heart-shaped brooch. Luckenbooth is traditionally given to a bride by her groom on her wedding day as a symbol of love (heart) and loyalty (crown). They were also attached to either the bedclothes or the clothing of a newborn child as it was believed to ease child birth and insure good breast milk. 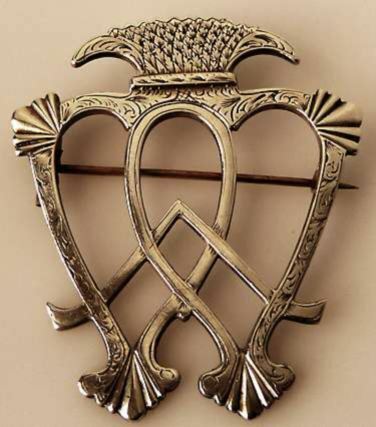 These brooches often have a crown above one heart, or two intertwined hearts with Scottish motifs like the St. Andrew's Cross or the thistle. The crown is designed after that of Mary Queen of Scots. 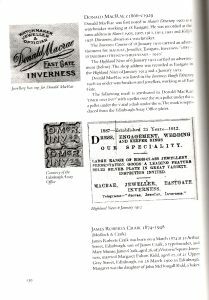 She gave a Luckenbooth brooch to her betroth decorated with her monogram and a thistle. The thistle is the national emblem of Scotland along with the Latin motto, Nemo me impune Laecessit ("No one provokes me with impunity"). 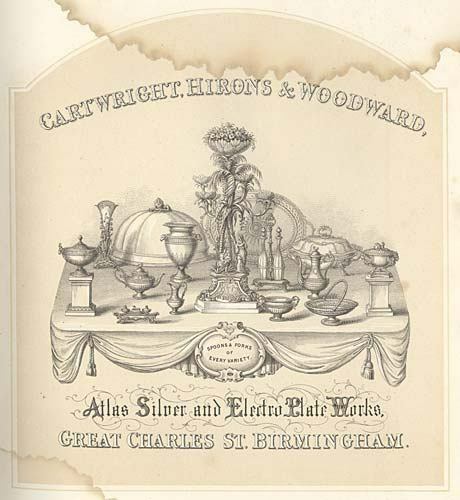 The firm was established in Birmingham c. 1850 by George Cartwright and Joseph Hirons, trading as Cartwright & Hirons. 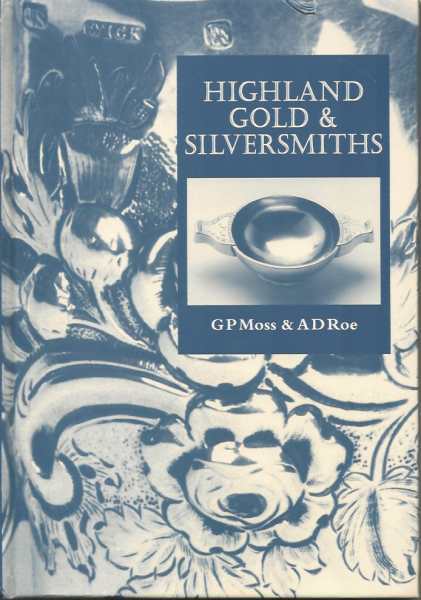 In 1853, when Horace Woodward entered in the partnership, the firm changed to Chartwright, Hirons & Woodward. The firm was active as electroplate manufacturers and silversmiths at 138/139 Great Charles Street, Birmingham, with London showrooms at 41 Hatton Garden. 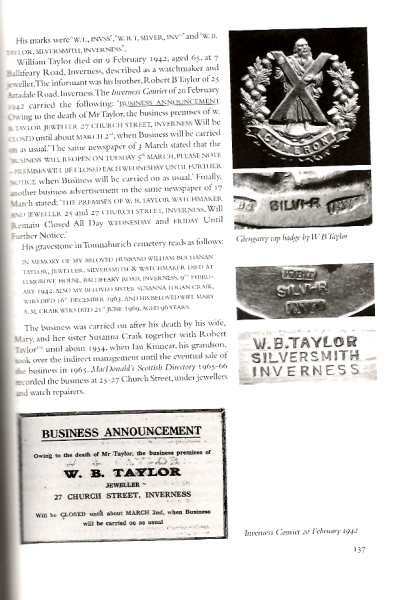 In 1859 Joseph Hirons left the partnership and the firm changed its name to Cartwright & Woodward. 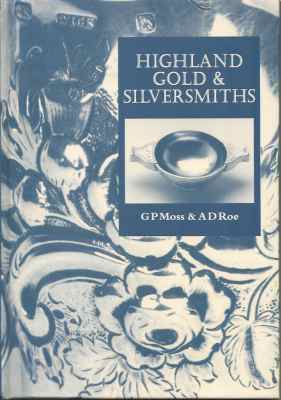 A comprehensive look at the gold and silversmiths of Highland Scotland, whose lives and work are revealed for the first time. 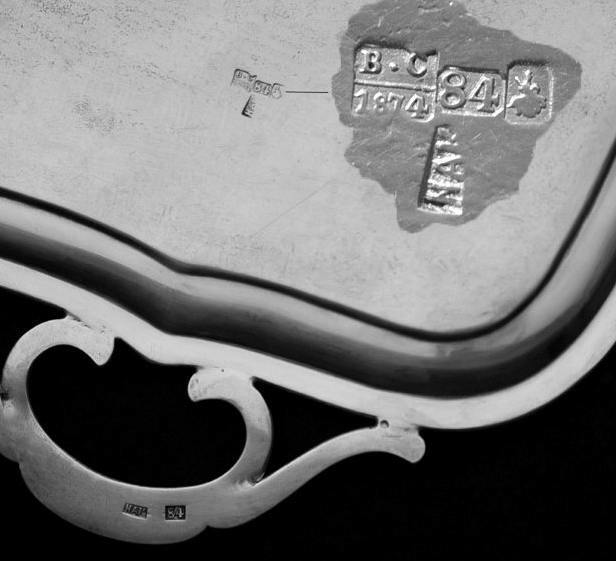 Original documentation brought together over years of careful research provide illuminating insight into the everyday lives of the skilled craftsmen, while photographs of notable objects highlight the techniques and materials they used. 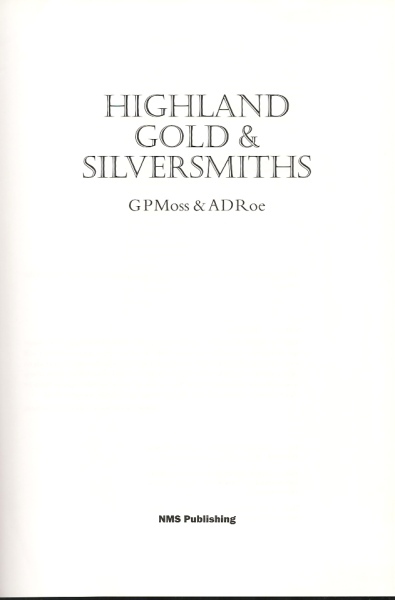 An invaluable source of reference for collectors, dealers, museums and libraries. Closing our December 2011 edition of ASCAS Newsletter I hope you have appreciated its content. My thanks to Wayne Bednersh, Maria Bigliani, Franck Bonnard, Gerald Gerhart, Enzo Vanarelli, Joanne Wiertella, Alan Yates for their invaluable contributions.